I’ve been chatting to Michael Marlow via email about insects and macro photography. I explained that the majority of my photographs are essentially record shots and that I rarely take more artistic photos. 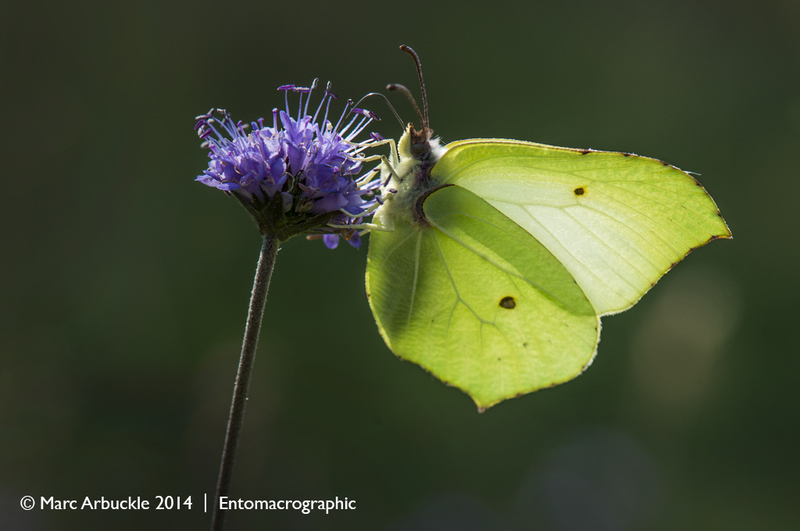 But here’s an exception, a photo of a male Brimstone Gonepteryx rhamni nectaring on Devils-bit Scabious and here’s another from a post last year. I guess what’s probably most surprising about that statement is the fact that I am an artist or designer of sorts, albeit primarily a graphic artist and illustrator by profession. However, I have dabbled more seriously on the fine-art side of things and in this I was much encouraged by my late father-in-law, Gerard Lumley or Marcel Zouf as he liked to be known when working as an artist. He’s much missed. For me though the fine-art path to be a serious painter led to nothing but trouble. Dilettantism, depression, and ultimately divorce. Well there’s only so much narcissistic self-destruction a relationship can take. Fortunately none of my paintings survive. I’ve rarely picked up a pencil or brush in the last 12 years but maybe my interest in insects will inspire me to start drawing again and who knows you might even get to see a doodle or sketch on this blog. Incidentally, Michael’s just written an excellent series of articles about the reverse-lens method and diffused-flash on his excellent blog BugPhoto.net which I can highly recommend. Thanks Michael, you are welcome it’s been a really informative series. In regard to the image I think it’s the light more than anything but I guess I had to notice it. Thanks Max. I have no regrets. As one door closes, another opens. I’m enjoying my macro photography and yes I’ll have to spend a little more time putting my creativity to use. Really nice shot. Also a fan of Michael. I can try to make my insects more interesting but the majority of options are in the hands of the insects. Of course you can improve your technique and field skills but with a live subject there is always an element of luck involved. However, the more you’re out there and the more practice you put in the luckier you get. It’s funny you mention the connection between art and insect macro photography because many people (as far as I know) believe that nature photography is void of creativity. I find that creativity is all about how you represent your subject, especially if you’re conscious of everything that is in the frame. Why can’t I find a green butterfly?!! I’m jealous. It’s not really green. I think it’s the ambient light giving that impression from the surrounding green foliage. The butterfly is actually yellow. But we do have a butterfly with green underwings called a Green Hairstreak, Callophrys rubi. Green Hairstreak? Reminds me of my high school days. My hair was red and black at the height of punk. Now grey and black.